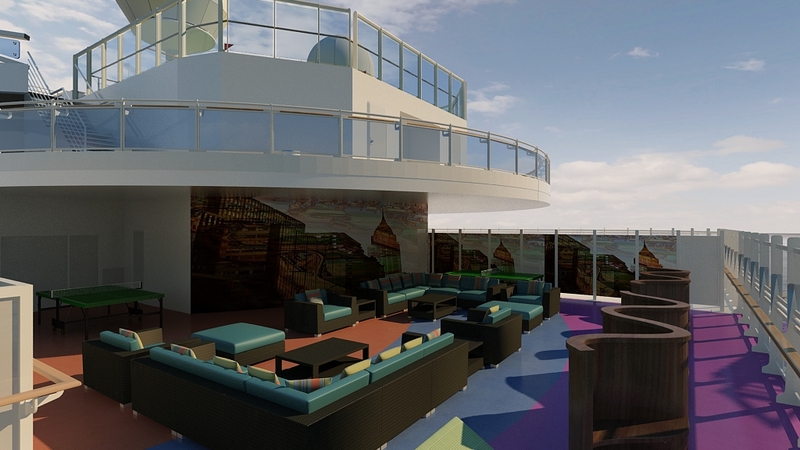 Royal Princess youth centers will include new outdoor lounge and play spaces. Even the youngest passengers will enjoy the many special features aboard Princess Cruises’ new Royal Princess when the ship debuts in June. The line has just revealed the amenities just for kids and teens that will wow younger cruisers aboard the new ship. Royal Princess will offer expanded space for youth centers that adds a new level to the onboard experience for young passengers. All age groups will find more space with dedicated outdoor areas, including a new teen lounge. Toddlers can also join the fun with a special fun area just for kids under 3. The new areas for kids and teens are detailed in the company’s latest video previewing Royal Princess, available at princess.com/royalprincess. Princess Pelicans (ages 3-7): The youngest age group will enjoy a great space for group activities like movie nights, a new mini air hockey table, a special area for arts and crafts programs, and a new indoor play structure. In addition, they’ll have a new outdoor play area, which includes toys, games, tricycles, and a new playground. These features add to the lineup of popular activities that kids love on Princess ships, including the Jr. Chef@Sea program, educational workshops, pajama and ice cream parties, and a Kid’s Fun Fair. Shockwaves (ages 8-12): Junior passengers in the middle group will now have their own dedicated outside area complete with lounge chairs and a variety of fun games. Shockwaves kids will really get into activities geared for their age – like air hockey, skeeball, and exciting game stations. They’ll also find their own lounge with a giant TV, a DJ Booth, and arts and crafts tables with activities led by Princess’ youth counselors. Plus they can hang out and enjoy their own pizza and ice cream parties or kids-only dinners. Remix (ages 13-17): The Remix area for teens will feature a Princess DJ booth loaded with cutting-edge tracks where music lovers can create their own playlist, kick back, relax, or dance to the latest club mix. In addition, there’s a new lounge area, perfect for meeting new friends, with games like foosball, skeeball and the latest video games. A brand new outdoor lounge fulfills a request from teens, and offers cool club lighting, contemporary seating, a great new wading pool, and of course music perfect for parties under the stars. Teens will also enjoy activities specially designed for their age group, including sports competitions, late-night movies, hip hop dance classes, teens-only “mocktail” parties, formal dinners, and the always-popular video game tournaments. The 3,600-passenger Royal Princess is a new-generation ship currently under construction for Princess Cruises. Among the special features found on board will be a greatly expanded atrium, the social hub of the ship; a dramatic over-water SeaWalk, a top-deck glass-bottomed walkway extending more than 28 feet beyond the edge of the vessel; plush private poolside cabanas that appear to be floating on the water; the new Princess Live! television studio; a pastry shop; a special Chef’s Table Lumiere, a private dining experience that surrounds diners in a curtain of light; and balconies on all outside staterooms. The ship’s 2013 maiden season will include cruises on the line’s signature Grand Mediterranean itinerary throughout the summer, followed by Eastern Caribbean cruises beginning in the fall. More information and video previews of the ship are available at www.princess.com/royalprincess. Additional information about Princess Cruises is available through a professional travel agent, by calling 1-800-PRINCESS (1-800-774-6237), or by visiting the company’s website at www.princess.com. This entry was posted on December 29, 2012 at 10:01 pm and is filed under cruiselines, cruises, cruiseships, family cruising, family travel. You can follow any responses to this entry through the RSS 2.0 feed. You can leave a response, or trackback from your own site.